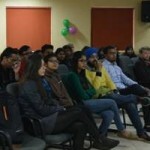 The HR Club IPSA, Jaipuria Institute of Management Noida organized CHAKRAVYUH, the HR management game under the vibrant support and special guidance of Dr. Shalini Srivastava, faculty coordinator and the members of the HR club, on 27th January‘16 so as to add on to the importance of experiential learning with the existing theories. The world of management domain is quite complex where management games play a very significant role. Management is taught as a collection of knowledge areas, separated from each other and the integration is left to the minds of the students. The management process is run in a system and the structure of such a system defines its behavior lucidly when the process is a simple presentation in the form of GAMES. 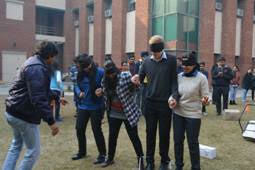 These games were organized primarily for students from CPIT, Christchurch, New Zealand who are on their study tour to Jaipuria Institute of Management, under Students Exchange program as part of our MOU with CPIT, Christchurch, New Zealand. 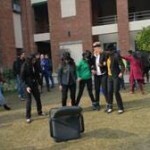 CHAKRAVYUH- the management games added to their learning experience in India. 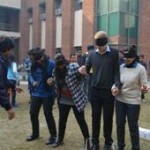 There were two consecutive games conducted under this event – “CROSSING THE HURDLES” and “THE DOG AND THE BONE” which taught about time management, team coordination, leadership etc. the winner team emerged to be- Saumya Ojha, Ishita, Shailabh, Surbhi Srishti and Sam and the runners up team members were- Shilpa Malik, Kritika, Gunjita, Atishya and Nina. We at Jaipuria understand that exchange programs create opportunities- opportunities for participants to learn, to prosper, and to work with others to solve shared problems and ensure vibrancy. Exchanges create future leaders who instinctively appreciate the value of international collaboration, understanding, and empathy. 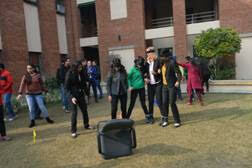 The event was highly successful in reaching its motive of participation and holistic learning.